Cover by Corinne Holt and Tom Scott, Sr. 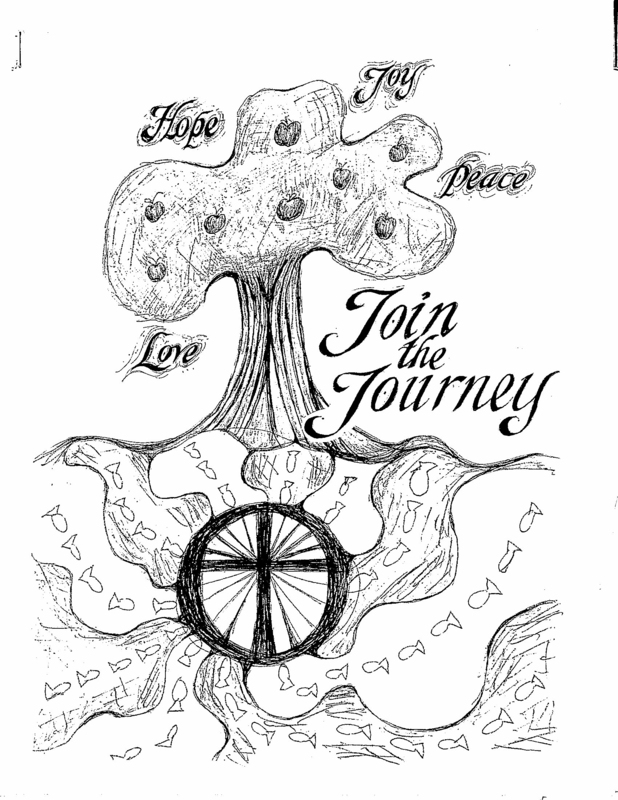 Thanks to Corinne Holt for her representation of fish (people) "joining the journey" to the wheel of the cross and then being drawn up into the branches of a tree where they produce good fruit of the spirit (hope, peace, joy, love). Thanks to Tom Scott, Sr. for his calligraphy on the cover and throughout the pages of this booklet. Prayer: Dear God, we are all one, one single seed. This Christmas let us find peace within us, so the strength of your love can grow, blossom, and be spread to all. We come back to the birth of Christ narrative every year at roughly the same time. This repetition may leave one feeling as if the story is stale and stagnant. Although the birth account may be familiar and the process seemingly, overly repetitious, we can never hear the same story twice. We are always on the move. We are always journeying somewhere. Even though we may know the story well, every year when we hear the story we find ourselves in a different place. Every year, we are different people and who listen to the story in a different way. Some years, we are in a radically different place. Other years, our place has only shifted slightly and may be difficult to notice. The scenes from the story in which we immerse ourselves during Advent and at Christmas are full of people on the move, literally, as well. An angel comes to Mary. Mary and Joseph travel to Bethlehem . Shepherds go to the manger. Magi follow the star. Mary and Joseph flee to Egypt . From the very beginning, those who tied their lives to Christ were a people on the go. From the onset, those who follow Christ join an unpredictable journey. We are all going somewhere. The direction in which we will go is up to us to determine. The movement motif reminds us that followers of Christ do their best to walk in the way of Jesus as they travel. Each year about this time when we recall when the Word became flesh, God extends or re-extends an invitation to us join God as we journey. This Advent season in worship, we will be exploring God?s invitation to us to join God as we journey. We will explore how God invites us to join the journey, some of the places one may go when one joins this journey, and some of the ways that one is transformed by God when one walks with God. Join us as we wait in anticipation for God?s invitation to us to join God's journey, yet again. Advent and Christmas are shaped and colored by comings and goings, by journeys. I think it all begins when God decided to journey from heaven to earth in person. When you read Scripture announcing the coming of Christ and then the birth and immediate events in the life of Christ, you are amazed at all the journeys that happen: Mary and Joseph from Nazareth to Bethlehem, God from heaven to earth, shepherds from fields to town, Mary and Joseph to Jerusalem, and later to Egypt, etc. Lots of journeys. But Bethlehem is the grand intersection where heaven touches earth, where the human journey meets the divine journey and the Christ is born, Immanuel, God with us. In a sense, Christ's life and ministry, then, is about the journeys he takes, where he goes, what he does. It is telling and compelling that in the middle of each Synoptic Gospel, Jesus makes an intentional turn and begins his journey toward Jerusalem , toward the Cross. But it all began in the journey to Bethlehem . In his superb book, The Life You Save May Be Your Own: An American Pilgrimage, Paul Elie chronicles and weaves the journey of four great writers: Flannery O'Connor, Dorothy Day, Walker Percy, and Thomas Merton. He begins his book with this arresting line: "A pilgrimage is a journey taken in light of a story." For you and me and for all believers, our pilgrimage is a journey taken in light of The Story. And it all begins in our journey to Bethlehem . Let's go, even now. Amen. Prayer: Wondrous Arriving God, as we make our way to Bethlehem this year, we pray that Christ will be born anew in our lives, and we be born anew in You. Amen. Writers in order of appearance: Corinne Holt, Jason Crosby, Bill Johnson, Andrea Woolley, Leila Arnett (1992), John Arnett, Pat Scott, Marjorie Ash, John Arnett x 2, Brittani Bair, Nancy Howard (2005), Roxann Hieb, John Arnett, Dorothy Spurr, Peggy Perkins, David Huey Cook, Sara Jo Hooper, Mera Cossey Corlett, Glen Skaggs, Brittani Bair, Carolyn Arnett, Marjorie Ash, Brent Williams (2005), Fay Leach (1995), Peggy Schmidt, Sharleen Johnson Birkimer, Debbie Brashear, Molly Mulroy, Mera "Susie" Cossey Corlett (2000), Nancy Howard (2009), Mera Katherine Corlett, John Birkimer, Anne-Britton Arnett, Kim Leach (2008), Lyle Edwards (1986), Mildred Burch (1986), Vera Peterson (1976), Wesley Edwards (1985), Wendell Arnett (1977), Bobbie Thomason (1997). A few days after my eighth birthday in El Paso, Texas, my mother died, leaving my father with six children to care for - an overwhelming task! Since my oldest sister and brother were already in college, my father decided, at great personal sacrifice, to let the older children continue with their education and to place us four younger children in a boarding school. San Marcos Baptist Academy was the school he chose. And from the miry clay. To his home on high. Now, I must admit that, at eight years old, the idea of being taken "out of a pit" was baffling to me; and I had absolutely no idea what "miry clay" was! I did know, however, what it meant to have "a song in my mouth," and we all loved singing that chorus at the top of our voices. As I have grown older, I have learned the meaning of these other words, too. I have experienced God's grace and forgiveness. When I have sought guidance, God has given light for my path. Prayer: How grateful I am, Lord at this time of year especially, for the joy and hope in my heart, made possible by the love and sacrifice, long ago, of my earthly father and my Heavenly Father. In the future some of the Karen-Chin among us will share with us their Christmas memories in the refugee camps and more tales of their long journey to America . We have participated in Christmas gift exchanges and are getting to know many of these fellow strugglers better. James Weldon Johnson?s 1900 Black National Anthem,"Lift Every Voice and Sing" (which Darrell Adams sang at Crescent Hill Presbyterian Church and recorded on his album, "Light in the Dark," 2003) could also speak for the Karen and Chin journey especially if one considers their escape from Myanmar to the camps. Where the white gleam of our bright star is cast." Lord may our church welcome the gleam of your star to illuminate the ways we need to go and how to be a welcoming congregation. Philippians 2:1-2 (NRSV) If then there is any encouragement in Christ, any consolation from love, any sharing in the Spirit, any compassion and sympathy, make my joy complete: be of the same mind, having the same love, being in full accord and of one mind. Tom feverishly worked on his paintings in the family room, preparing for a watercolor exhibit, while I worked in the kitchen preparing dinner. I suddenly became aware of the connection of both white paper and white dishes waiting to be made complete. The efforts mixed in a special way and I felt a perfect kind of peace and happiness. As Tom quotes, ?The reward is in the doing.? By the way, the painting was glorious and the food delicious. It was my eighth Christmas, and I had looked forward to the church Christmas play for some time. The morning of the play, it began to snow and it continued to snow all day. The excitement occasioned by a Christmas snow was subdued, for the question loomed over my home: would we be able to go to the play? Since my father had no car and we lived in the country, someone had offered to take me, my brother and my sisters. That evening we were dressed to go, and we waited patiently up to a point. Then my older sisters decided that they should walk to a neighbor?s house about a mile away and go with their friend. OF course, I wanted to go with them. Mother, however, wouldn?t let me; she thought the snow was too deep and I was too little. I, unhappily, sat and waited for a car that never came. My father waited, too, but he didn't seem too concerned. Suddenly he began sneezing repeatedly. I still remember clearly the frustration and anger I felt - Daddy just sneezing while my heart was breaking. I could stand it no longer; angrily I burst out in loud imitation of my father: "His-ke! His-ke! His-ke!" He was a strict disciplinarian, but must have understood something of my feelings, as I was not scolded for my mockery. Now I wonder about Mary and Joseph. Did Mary feel that same deep negativity when the journey was long and difficult, when her stomach was heavy and the donkey uncomfortable? Was Joseph angry, disappointed and frustrated when there was no room at the inn? Mary and Joseph could not have known that the child born at the end of their journey would change the world. Yet I am certain that when their child was born, the dire circumstances they had suffered along the way were forgotten in the joy of the birth. Perhaps in difficult times it is important to remember that we do not know the joy that may yet await us. We do know that Jesus has told us to remember that he is with us always, "even unto the end of the age." Prayer: Thank you, Lord, for the gift of Jesus and promises that give us hope. In the play "Man of La Mancha" Sancho Panza is asked why he follows Don Quixote, and all that he can come up with is, "I really like him." Often, that's good enough reason to follow Jesus. During our church's 75th anniversary in 1983, John Claypool preached a sermon on the Good Samaritan in which he asked the question, "Why do you suppose it was the Samaritan who stopped the render aid to the man beaten by the side of the road and not the priest or the Levite?" He proposed three possible answers, the first of which was that the Samaritan may have had more courage than the other two. He described how the journey from Jerusalem to Jericho was a steep and treacherous one, and there were many caves and crevices where thieves could hide in waiting. Somehow the Samaritan's courage was able to overcome his fear of making himself vulnerable by stopping to help the stricken man. Many of us who deal with the public have to put ourselves at risk to answer questions, give directions, fix houses and automobiles, try to make diagnoses, teach rowdy students, play instruments, fix computer programs, etc. With every encounter there?s some risk, and we need courage to make our way along life?s journey. Claypool went on to describe two other answers for the Samaritan?s action including the fact that the Samaritan may have been under less time pressure than the priest and Levite who perhaps were hurrying to some meeting or other appointment. The third reason and the one he liked best was that this particular Samaritan knew what it was like to be beaten down with discrimination and yet had the vision of life as gift that moved him to be a true neighbor to the man on the side of road. Lord, grant us shy people the strength [and courage] to get up and do what needs to be done. "Two Broke Girls" is a new show I've started watching this fall. One roommate has fallen from riches to waiting tables; the other has been a waitress for a long time. In the Christmas episode, the formerly rich girl is joyful about Christmas? coming while the other states indignantly, "Christmas is about buying stuff to try and fill the dark hole in the center of all of us that says "Life is hard and then you die." I think we?ve all felt that way at one point or another. And with the economy so down, we are constantly reminded how little our toil brings us. While Christmas is not really about buying stuff, that dark hole inside all of us is real. It cannot be filled with Christmas presents or dinners or decorations, or all of the three-pump peppermint, three-pump-chocolate Starbucks mochas money can buy?sigh. The only thing that fills the hole is God. As Saint Augustine said, ?Our hearts are restless till they find rest in You, O God.? If that dark hole gets bigger for you around the holidays, like it does for me -- if each year more chairs around you table and more of your pockets are empty, take a moment to remember the true riches of Christmas: ?the Word became flesh?? God became a human baby and came to us, poor and lowly. As God approaches us newly this Advent, listen to the invitation for all of us who are restless or lacking self to fill ourselves with God?s own self, journeying from the darkened void into the Light within. Scripture: Then Samuel took a stone, set it up between Mizpah and Shen, and said: "The Lord has helped us all the way" and he named it Ebenezer "Stone of Help . . ."
Some years ago I read an article about the history and symbolism associated with the Christmas tree. One writer suggested naming your tree ?an Ebenezer? to symbolize how the Lord has helped you/us. The Ebenezer described in I Samuel was established to remind the Israelites that God had help them defeat the Philistines. The second verse of the great hymn: "Come Thou Fount of Every Blessing? reads "Here I raise my Ebenezer hither by thy help I come"--a reference to Ebenezer in I Samuel. So each year, when I erect my Christmas tree, I place a sign on its branches that reads: "Here I raise my Ebenezer: God with us." Across the years I've had all manner of Christmas trees. I remember the year Mother sent my colorblind brother to buy a tree. Her brought home a beautiful tree; however, it was most brown. We couldn't afford another tree so we sprayed it with green paint and still enjoyed it. My first tree in my first apartment after college was a real trip. I thought it likewise lovely but by Christmas all the needles had fallen off. It looked like something out of the Adams family?bare branches with lights and ornaments hanging down. Big or little, real or artificial, cheap or expensive?each time, no matter its state, on goes the sign. It reminds me over and over of how God, through his son, has established the ultimate Ebenezer. Dear Lord, helps us to remember that through the tinsel, trees, lights and festivities of Christmas that the real gift is your beloved Son. Any trip to nature is a trip to visit God. Whenever I need to spend time with God, I try to take a journey to our creek. Making my way down the hill, through crunchy leaves and broken twigs, helps clear the busy clutter from my head. Kneeling on the bank at the creek edge reminds me of kneeling in prayer before God. Always I must touch the water. In winter, I remove my gloves and enjoy the crisp coldness a my fingers dip beneath the water's surface. Water sustains physical life; God sustains our spiritual life. So touching the water, to me, is like touching God. Over the years, I have made many journeys to the creek -- most of them alone. My favorite journeys now are the ones taken with children. Hopefully they will feel the presence of God in nature's many wonders. Some of the children who have journeyed to the creek are: the first and second graders from the church, the Woggon girls, the Pope children, one Pessolano granddaughter and five Debusman grandchildren. Walking to the creek is the contemplative part of walking in the way of Jesus. Have faith in God, have faith in God." 'I am satisfied with thee.'" Chorus: Wherever He leads I?ll go?." And all who would might enter in and no one was denied." Grandma taught me to attend to what we saw in the woods when we took our walks. She knew the birds by their calls. She'd say, "That's an old Blue Jay fussing." She knew the names of wildflowers, and knew where the ferns and mosses, may-apple, trillium, violets and jack-in-the-pulpits grew. What we saw and heard along the way was as important as our destination. I believe this is true of our life-journey also. When we turn aside from our ubiquitous screens and earphones, our schedules and important tasks to consider persons and things are right before us, we find life in the Spirit. and white and yellow violets beside a woodland stream. You marveled when I spied a jack-in-the-pulpit! Heavenly Father, Help us receive your gifts waiting in our path along the way. Amen. The animals in the Nativity Scene all add to the serenity of it. Animals in my house seldom added to the peace. Two birds nesting in the Christmas wreaths flew in when the doors were opened. All windows were raised, and the whole family was chasing the poor birds down the hall and around the house trying to get them out. The cat tipped over the Christmas tree, and we had to redecorate. The cat brought in a mole (and was playing with it on Tricia?s bed), and I was yelling "Get this mole out of here!" But, thinking about the stable, surely it was not as peaceful as it appears. A baby was being born using natural childbirth. There was excitement and activity ? and probably much yelling by mom and babe. It was only later there was pure joy and peace. The animals could return to their grazing and rest. I wish you much activity and excitement, joy and peace, and many family stories and memories. I must have known it would come -- the news that Dad had died. So I was not surprised in late July, 1970 -- six weeks after I'd left the States for my life as a Peace Corps Volunteer in Sierra Leon, West Africa -- when a nurse asked me to join her in someone?s office in the Peace Corps rest house in Bo. Yes, my dad?s life had ended. Two days later I began the second leg of my long journey home -- a flight from Freetown to London . An airline strike in England had forced the cancellation of hundreds of flights, and left me stranded. All alone -- or so it seems -- I felt the presence of God in a motel room near the airport, as I wept in the night. The following morning it was truly amazing: somehow I found a seat on a flight bound for Detroit -- the best I could do -- closest to Louisville or Columbus . I didn't know where the family would be, but for some reason I chose Columbus and barely made the connection. My journey ended at the front door of my parents' new home in Worthington , Ohio , as my older brother C.V. and I embraced one another. The family had just returned from Dad?s memorial service at Crescent Hill earlier that day. It was good to be home. I was grateful for God?s presence throughout my lonely journey. God, help us remember that you are with us, wherever we are. You?re invited! The phrase promises something -- just picturing the words conjures leaning forward, leaning into newness, reaching for what the future holds. Sometimes the invitation sends us into hiding because we are so afraid of where it might lead us. Sr. Barbara's declaration, in last fall?s retreat, "All God wants from us is everything," produced a stunned silence in our group of forty women. What does that look like in real life? ?You are invited to give birth to the Son of God,? was the shape it took for Mary. How many reasons can we find for Mary to shout, "No!" to this idea -- She's a teen-ager. She's engaged to Joseph. She lives in a culture in which women are stoned to death for adultery. It?s impossible! It's preposterous! "Yes," she says. She does have the presence of mind to ask the angel how this could be since she hasn't yet been with a man. "No problem," the angel replies, ?God?s spirit will come upon you.? Regardless of how literally we take this story, the image of a young girl assenting to this incredible invitation, stirs our imaginations and shakes up our carefully defined limits on which journeys we are willing to take for our faith. Could God really be asking me to do something radical? Prayer: God, help us find the courage to be willing, just for today, to throw out our fears and throw ourselves fully into the life you offer us. Amen. When I passed Cathy in the hallway, I smiled and did a double take. There was no mistaking it. Strung across her shoulder was a bag made from a red plush Christmas stocking. Each December, we chaplains contacted churches and civic groups so patients might receive stockings. Their contents were simple: a warm hat, gloves, socks, a crossword puzzle book and candy. It was now January. In the state psychiatric hospital, I had grown accustomed to persons making outrageous fashion statements. I knew, though, that Cathy had been going to placement and job interviews as she prepared for discharge. Concerned about what prospective employers might think of a woman carrying a Christmas-stocking-purse, I asked her about it. It was simple, she explained. She was homeless, out of work, and had been hospitalized for months. She had dreaded her parents bringing her children to visit on Christmas Day, knowing she had nothing to offer them. But by some miracle, she said, she had received a stocking full of gifts on Christmas morning. Laying out the items, she counted. There were just enough for each one to receive a present. In the hours before visitation, she used markers to decorate plain copier paper. With tape and a bit of tinsel, she wrapped each trinket. Her eyes brightened as she described the joy that she found in giving away all that she had. And?something remained. ?I still had this sock,? she said, ?but what I wanted was a pocketbook.? With a wide-grosgrain-ribbon and a little sewing help from the art therapist, Cathy was able to take what she had and turn it into what she wanted. May our eyes be opened so we might know the miracle in what remains. There is no Christmas story in the Gospel of John, no birth narratives, no angels and shepherds, no wise men. But there is joy. It is a different kind of joy. Instead of our proclaiming joy at the birth of Jesus, Christ finds joy in our continuous renewal in community, dependence on him, and love for each other. Christmas is a time to share with our family, our community of faith, and the whole community. The whole community includes all people, particularly all ethnic groups and genders. We are all personally responsible for maintaining the community by not being dependent on each other but on Christ. Christ is the vine and we are the branches (John 15:5). Through Christ's love for us we are able to love one another so that we may become one with him and each other (John 17:22). This is the kind of love that produces unshakable joy (fulfilled, complete joy) and pain turns to joy (John 16:20-22). Remember during Advent and through the rest of the following year to celebrate the hope, love, joy and peace that Christmas brings. Prayer: Gracious Lord, thank you for the joy we have because of your birth and the joy we have in sharing your birth with others. If you were to look back through God?s home videos of the CHBC youth group over the years, in every third or fourth clip, you?d see a big circle of teenagers singing Darrell's "The Family of God." Sometimes you?d see them around a campfire in the woods, sometimes on a college campus at Passport, sometimes in the youth lounge, sometimes in a Sunday school room. Sometimes they would be singing with a great and deep joy, and sometimes they would be singing through the piercing agony of grief, sometimes with a great sense of enthusiasm from some spiritual renewal, sometimes not. In the clips from 2007 onward, you?d begin to see and hear a new version of the song. This one has some of the old sound and some of the newly added, enthusiastic and joyful musical twang of the Karen vocal style. It might sound a little strange or unfamiliar to ears that have been here for awhile, but it is the same song we?ve been singing all along. The same message is expressed each time: it?s good to be in God?s family. That looks different than it used to look at CHBC. Our family now includes people from opposite side of the world. I think our CHBC family looks more like the Family of God than ever before. In the Kingdom, all skin colors and cultures hold hands like family. ?Over the river and through the woods? gives me a homey, warm feeling. Christmas, 1999 found our family going over the mountains, through the snow and sleet, and arriving in Richmond , VA , to be together for Christmas, and the expected birth of an after-Christmas baby. This was the first child or grandchild, so it was special. for skies of blue and sunshine fair. For every gift I raise a prayer. One of the joys of the Christmas season is reflecting on Christmas memories. One of my special memories is the year older sister wrote and directed a Christmas play for our Thursday night neighborhood prayer meeting held at Nois Cardwell's home and led by "Uncle Bert" Cardwell. The play, one of the bathrobe variety, involved the angels, the shepherds, the wise men, Mary and Joseph, and even Herod. Although there were quite a few kids in our neighborhood, we each had to play several parts in one scene, my sister was Herod and I was his slave. The first time we practiced that scene, my sister said, "Down, dog," when I came into her presence, and I, not being willing for her to call me a dog, quit the play in a fit of anger. That almost brought an end to our performance, but Mother mediated and my sister substituted another derogatory term that I didn?t find so offensive. The play came off as practiced. We all knew our parts. Dorothy Divine Spurr was a beautiful Mary and cousin Ronald Gibson was Joseph. As an adult, Ronald told me that it was very exciting being Joseph with Dorothy as Mary, even if he was almost four years her junior! A world war raged on the peripheries of our world that Christmas, but our little world was peaceful. Mother said our play was the sweetest Christmas play she had ever seen, and those of us who were the actors were egotistical enough to think she was right! Prayer: We praise you, Lord, for the good memories of childhood. The adventure story is one that has to have something happen. There has to be action and conflict within this type of story. The author has to have the reader identify with a character in the story in order to "draw them in." Adventure?a risky undertaking, or a remarkable and exciting experience. It seems to me that there is a disparity between the meaning of the root word, "arrival," and what the word "adventure" has come to mean. We think of ?going on? or ?setting out? on an adventure, not arriving. Perhaps we can't "arrive"? until we set out. God set out on an adventure when God arrived/enfleshed/incarnated in Jesus. God became a character in our story with whom we can identify, who draws us into a wild and exciting undertaking. Because of Advent, Jesus' arrival among us, God invites us into God?s own adventure. God wants to adventure with us into the world as we seek to walk in the way of Jesus. God, help us see the exciting adventure you're up to in the world. Help us discover our part in your story. In the early 1940's I spent many hours at my father's gas station because it was necessary for Mom to work there while Dad worked two other jobs. The station was on a corner. My two brothers and I often climbed the six-foot fence beside the station, to watch Germans working in a steel/iron yard while being guarded by Americans with guns. On the other side of the station was a junkyard and warehouse, which was supposed to be forbidden territory to us three children because of the large rats. And what was a mother to do in the midst of this place with her three young children? She taught us to make flower beds and grow zinnias and marigolds. And everywhere there was a little bit of soil, our flowers bloomed. Now, my own three children help me plant tulip bulbs, azaleas, and vegetable plants and seeds. Sometimes the winter is cold and long, and it is a long wait before we see the flowers bloom, but these experiences of my past have become God's unwritten, unspoken textbook of hope. God, thank You that in the midst of the December winter, we can remember the tulip bulbs that lie under the ice and snow waiting to bloom in spring. Thank You for those who taught us to plant seeds. Thank You for the hope that comes with a tiny Baby in a manger. In 1982, my sister, Carolyn, and her husband, John, called to invite us to move to Louisville . Carolyn was in law school and John, in a demanding medical practice, was working long hours. As she said, ?This family could use an extra pair of hands.? The journey continues as their children, Anne-Britton and David, grew, needed transportation, stopped by when needing water while on bike rides, wanted a ?sleep-over? or just time to play Legos or games. One May morning, after her son, Logan, was born, Anne-Britton and kids were in town visiting. As we spent time sharing, I repeated the phrase Carolyn had said to me 20 years previously. I invited her back to Louisville , noting that her family "could use an extra pair of hands." My birthday gift that year was an infant car seat, as she invited me to share in caring for Morgan and Logan. What a gift! Almost 10 years later, with Morgan in middle school and Logan headed that way, this journey called family still brings delight. As the beat goes on?and the smiles of shared times go on?I thank God for the examples and lessons in being family. And I thank family for all the times -- smiling, tearful, nervous and grateful! 30 years in Louisville only leaves one anticipating the next 30 ? on this wonderful and blessed Journey called Family. Prayer: Thank you, God for Mary's hands caressing the baby Jesu -- and for your great love, holding the world in your mighty hands. It reminds us ? this family can always use an extra pair of hands. Between 9:15 and 10:45 am each Sunday morning approximately 20 preschool boys and girls are greeted by their teachers in preschool classrooms on the ground and sanctuary level of Crescent Hill Baptist Church . From then until worship is over their lead teachers and assistants will do age-appropriate activities such as providing the children with an art project related to the Biblical theme for the day, telling them a story from the Bible, changing their diapers, hugging them to help them learn to trust adults other than their parents, feeding them, assisting Laura Chipe in introducing them to musical instruments and simple Christian songs, and monitoring their play to prevent injuries and encouraging them to share. These activities are designed to help the boys and girls begin to "Walk in the Way of Jesus". Learning to trust that their parents will return to get them after worship is the beginning of learning to trust God; a hug by an adult who smiles at them and tells them stories about Jesus is a way to learn that God loves them; an adult encouraging them to share toys hopefully assists them in learning to cooperate as they become the People of God. Prayer: God, guide those of us who teach the preschool children to be filled with your spirit so they will begin to know what it means to ?Walk in the Way of Jesus? Amen. The summer after Matthew?s 8th grade year, he was lucky enough to be one of the youngest youth at CH to attend the Baptist Youth World Alliance in Zimbabwe . This was a life changing experience for him in many ways, one of which is his love of wanderlust. He has traveled to every US state except for one, as well as Europe, Asia, Canada , and Mexico . For Nick, the Baptist World Youth Alliance was held in?wait for it?? Houston , Texas . Despite that destination both boys have loved traveling to many places. I have always encouraged them to expand their horizons, as I have offered them a comfort-filled place to come home. As the boys developed their own personalities, they both have seemed to follow their own ?drummers?. Life has not always been smooth sailing for them or for their single mother, but they have grown into unique young men following dreams which have taken them as loving ambassadors on many worldwide journeys. Of course, this has also allowed me the opportunity to visit and/or accompany my sons on many adventures. They talk sometimes of moving closer to home. I gladly anticipate those possibilities also. As Jesus did for us: THANK YOU! Luke 2:13-14: Suddenly a great company of the heavenly host appeared with the angel, praising God and saying, "Glory to God in the highest and on earth peace to folk on whom God's favor rests." Psalm 89: I will sing of the great love of God forever; with my mouth I will make your faithfulness known to all people. At this time of year, my family likes to spend time in the bars along Frankfort Avenue . All three of us agree that the hallmark of our holiday season comes as we bar (and restaurant) hop along the street that runs like a ribbon in front of our church. We anticipate the days when most of the windows of our Advent calendar have been opened, and expectation is palpable. From Porcini's to Ginny's Diner, the streetlights and even stoplights blink a bright red and green as we make our traditional pilgrimage. I have discovered that my family looks best to me in this light. Kevin's eyes shine especially bright and Mera Kathryn's cheeks are painted rosy by the brush of the nighttime wind. We are not alone. There's Rowan, the leader of this pack, and Darrell, who lends his voice to the cause. Reba shakes a few hands along the way, and Tina introduces us to neighbors that we may never have met. There's Tim, whom I met on a Colorado mountain more than 20 years ago and Thea with the voice and face of an angel. Over the years, others have joined our corps and have been welcomed with a mirth-filled "the more the merrier" attitude. Magi-like, we sojourn westward; our only gift is that of a song. Though our voices may never fill Carnegie Hall, we are legendary in places like Clifton Pizza, the Crescent Hill Firehouse, the Irish Rover and the Clothes Up and Personal laundry mat. Old regulars welcome our encore performances. New patrons are caught by surprise not unlike the startled shepherds on a Galilean hillside so many years ago. There are no words to express the magic that happens each time a buzzing restaurant crowd grows quiet, listening for the strands of a familiar carol. Some folk join in and sing along. Once the jazz band at Zephyr Cove provided accompaniment. A tear in the eye of a guy at a bar is not unheard of and neither are embarrassed grins from teenagers being serenaded as they rent videos. A music scholar once described Christmas carols as "essential lullabies." I suppose it's not surprising, then, that our trek along Frankfort Avenue always brings a sense of joy and peace to us and to our neighbors. It has become for us an epiphany of hope, a human manifestation of Harmony Incarnate. Prayer: Wonder of wonders, Miracle of miracles, we raise our voices and echo the song that swept over the earth. We celebrate that you have come into our world and into our hearts. May we share the Good News along the avenues of our lives that others may find You in grace along the journey. Amen. Them heard a choir sing, the music came from afar. Them find no place to born she child, not a single room in sight. Of course I love the song for its message. I have also always appreciated the contributions of Harry Belafonte -- an African American man who grew up in a time when he was not always welcome. We appreciate him in many ways today. We celebrate his lovely song with its special message to each of us -- "we shall live for ever more because of Christmas Day." Isaiah 40:1-5 ?Comfort, comfort my people, says your God. Speak tenderly to Jerusalem and proclaim to her that her hard service has been completed, that her sin has been paid for, that she has received from the Lord?s hand double for all her sins. A voice of one calling: ?In the wilderness prepare the way for the Lord; make straight in the desert a highway for our God. Every valley shall be raised up, every mountain and hill made low; the rough ground shall become level, the rugged places a plain. And the glory of the LORD will be revealed, and all people will see it together. For the mouth of the LORD has spoken.?? Christmastime brings with it traditions held dear to families and communities. During my time at Hanover College , the people of Madison and Hanover held an annual performance of Handel?s Messiah. For many in the community, the performance was the arts event they looked forward to all year. Each year a new child would be ?old enough? to join the community choir, adding a new voice to mix and mingle with those of persons whose vocal chords had carried Handel's notes for decades. The energy was palpable. Handel's Messiah is recognized as a standard at this time of year. Songs such as ?For Unto Us A Child Is Born? and ?Rejoice Greatly? express both the longing and the joy that come during this season. However, I have always felt that the first words sung hold the most power: "Comfort Ye." For many, the greatest gift comes in the form of comfort. When God's people were in captivity in Babylon , comfort carried the message of hope for which they most longed. May we remember that the same God who stood with her people in the midst of suffering in 500 B.C.E. dwells with us now. Let us allow ourselves to be comforted, and may we, in turn, comfort others. Over Christmas 2009 we visited my daughter and her family in Memphis Tennessee . While there we attended noon mass on Christmas Day at Holy Rosary Catholic Church, a mass celebrated by Associate Pastor Rev. Charles Bauer. He preached a Christmas sermon unlike any I have ever heard. I?ll paraphrase it briefly, to the best of my memory. Rev. Bauer began by speaking of Abram and his willingness to do God?s will, his taking a long journey from his home, trusting God's promise to give him a son, and to give him and his descendants a new land. The good priest spoke of (now) Abraham living in a tent, facing the desert?s cold nights and hot days, the scarcity of food and the risk of attack by robbers, and the challenge of living in tents and facing the same cold and heat and scarcities and risks that Abram had faced earlier. Rev. Bauer emphasized the difficult conditions first Abram and then Moses and their people had to face living in the desert, in their tents. And then the good priest made his Christmas point: over two thousand years ago, God came down and pitched his tent among his people. And there it was: no baby Jesus, no manger, no shepherds, no wise men. (And surely no holly, no bells, no glitter nor carols.) Just the simple statement that God had joined his people (and by implication would share the cold and heat and scarcities and risks they faced and face today). When I reflect back over my life, I recognize that I have been on so many different journeys. There have been dark journeys, exciting journeys, and cumbersome journeys. Some I have ventured alone, some with family and friends. Many of those journeys include family and friends in this congregation, both in today's congregation, and in the congregation of days gone by. I find myself worrying most about the future journeys...specifically the journey my life will take after my children move on to journeys of their own, that may not revolve around me! I know that God has a delightful plan for my future journey, so I must cling to that. Having never walked a Labyrinth before, I didn?t really "get it". But a time had been scheduled for a walk to focus on healing for Mom, so I went to check it. When I arrived I looked around the room and saw so many people: people that that I had known all my life and grew up with; people who knew my parents since before I was born. In fact, the room was filled with people I love dearly, and when I looked around I saw how much they loved me, my family and my Mom. We said a prayer: "Spirit of the Living God, present with us now, enter us body, mind and spirit and heal us of all that harms us." Then Mom walked to the center of the Labyrinth. When others started to walk the Labyrinth, I decided to give it a try. As I walked, I began to relax; I focused on releasing my tension and busy thoughts. When I got to the center I sat down beside Mom, to enjoy being near her as people greeted her. I could feel their love and the calming presence of God. As I started walking from the center of the Labyrinth, I realized that I was walking away from Mom and I felt panic and pain. I wanted to stay and sit with her forever. I felt like I was losing her, like I was leaving her behind with God. But I chose to keep walking, moving ahead, one step at a time. As I walked and cried I became aware of others walking with me. And though I knew that one day I would have to walk my path without Mom, I could see that I would never walk alone. Walking the Labyrinth with others gave me new confidence and strength. Prayer: Spirit of the Living God, present with us now, enter us body, mind and spirit and heal us of all that harms us. Amen. The summer after my junior year in high school was a very low time for me. I had not done well in school; my final grades were passable but nothing worth bragging about. My self image was very low. Three days after school let out our church's youth group went on its annual excursion to a camp in North Carolina . During the bus trip I was quiet and sullen, sitting mostly by myself. I hate to say it, but at that time I was so low I was actually questioning the existence of God. Each year part of our journey to In the Oaks leads us through the Great Smoky Mountains . That particular day we were caught up in a storm system; the sky was gray and bleak--perfect weather for depression. Dark clouds hung heavily in the sky, but even this threatening sky was dotted with bright patches of clear blue sky, gleaming with golden streaks of sunlight. As I looked out on this beautiful scene I was touched and a smile broke on my lips. I asked myself, "How could there not be a God? Look at this!" There it was in front of me: through all the gloom and depression of the world, the love of God was streaming in to touch my heart. For the first time in weeks, I felt truly at peace. "Peace I leave with you ... let not your hearts be troubled." Dear God, provider of peace and Love, give us Your peace to hold us through. Help us be agents of Your peace, that no one should be denied knowing You. In Your name we pray; Amen. The beginning of 1986 brought about quite a change in my life when I sold my home and moved into an apartment. From the eighth floor I can look over the tree tops and directly into the eastern sky. Many mornings I watch the sunrise. What a joy! I never cease to be amazed at the beauty of the flaming, morning sky or the glorious afternoon sun creeping over the western horizon. Each time, I am reminded of God's majesty and glory, and most of all, of God's faithfulness. Since the first day of creation that sunrise has taken place, and without that light there could be no life upon the earth. I think back, however, to the darkness before the dawn--a time when I feel God's nearness--and realize one has to experience the darkness to truly appreciate the light. Henri J. M. Nouwen, in his book entitled Aging, The Fulfillment of Life, deals with two different views of aging: "Aging as a way to the Darkness" and "Aging as a way to the Light." How good it is for all of us, especially those of us who are older, to realize that we can continue to grow and look joyfully toward the light. Dear God, the assurance that You have been and always will be there brings us great joy. Thank You for the gift of Your Son, the ''light of the world" through whom we have life eternal. At a certain point in a tour of Mammoth Cave , the guide extinguishes all the lights. There, far below the surface of the earth, with no glimmer or reflection of light from any source, the darkness is so deep that it seems almost tangible. To find one's way out of the cave in such darkness would be impossible. But when the lights come on, the way is made plain. The prophet Isaiah used the imagery of darkness and light as he foretold the coming of a great leader for his people. To those who were stumbling about in darkness, he would come as a glorious burst of light. Their joy at his coming would be indescribable. The writer of the Gospel of Matthew saw in this passage a foretelling of the coming of Christ, who was to become the Light of the world. Prayer: Our Father, as light dispels darkness, may the indwelling presence of thy Spirit dispel our every doubt and fear, and fill us with joy this day and every day. Amen. In 1860 the PONY EXPRESS was formed to carry the mail across the west from St. Joseph , Missouri to San Francisco in less than half the time ever recorded. The eighty young men forty starting east from San Francisco; forty starting west from St. Joseph, Missouri) were messengers not always of good tidings of peace but messages from loved ones, of business, disasters, and sometimes of death. How exciting it is to read the adventures of these daring young men rushing their horses at breakneck speed through all kinds of weather and dangers to bring these messages! As the Pony Express served so greatly in the 1860's, so the Prophet Isaiah was saying how great and wonderful to see a messenger come running, bringing good news. And the good news, says to Zion is: the news of peace he "Your God is king." Prayer: Our Father, as the world searches for peace, through the United Nations, and through our ambassadors for peace in the Middle East , we know that there never can be a lasting peace until the world is Christian and the Prince of Peace comes again. Amen. There she was! I was walking along my favorite route at Sacred Heart campus thinking about how my current class of eager and energetic first graders were shaping up. When I turned the corner I noticed a group of 6 and 7 year olds out in the field having their football practice. There in the middle of them all was a little girl wearing pink leotards, a lacy tutu, sneakers, and her dark green football helmet, kicking that football with all of her might. Surely this was a Kodak moment, but unfortunately no camera was in sight. It was a joyful and unexpected event?I laughed right out loud at the incongruity and beauty of it all. Many thoughts came to mind?among them that this little girl will not be stopped by anything. She intends to do it all. God will not be stopped by anything either, especially by forms and expectations and rules. I am reminded of just a few of God's unexpected promises?become as a little child if you want to enter the kingdom of heaven, blessed are the hungry for they shall be filled, the first shall be last and the last shall be first, let anyone who would be great among you be the servant of all. I finished my walk with a smile on my face and plenty to think about. Why not pink tights and a football helmet? Why not God's incongruous promises? Why not, indeed? God of Joy, keep our hearts and minds open to your glad surprising. Amen. "Advent 2011" copyright 2011 by Crescent Hill Baptist Church, 2800 Frankfort Avenue, Louisville, KY 40206. No part of this book may be reproduced in any manner whatsoever without written permission of the publisher.